Drone Camera Aerial Photography Quadcopter Gopro camcorder full hd lens. Many drones already have a built in camera. Other models do not. These include many of the DIY hobby type drones that you build yourself from a kit. You can carry an action camera using a special Gopro holder mounted underneath the drone. This can be a simple fixed holder, or a brushless gimbal to stabilise the camcorder and keep it pointing at a fixed angle. The gimbal gives a smoother video as the drone is prone to moving around and changing angle whilst flying. With the gimbal you can also change the angle of the drone camera remotely from the ground. 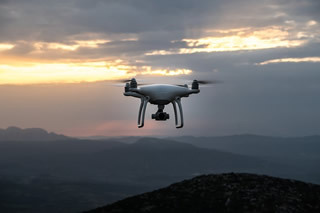 There are many possibilities for creative aerial photography using quadcopters that did not exist before, without using other more expensive aerial filming methods. What is the best lens for a drone? It depends on your personal preference. However the standard Gopro fisheye lens is designed for capturing images where the subject is close to the camera. With aerial photography the subject is on the ground, and this is often a long way from the lens. The details on the ground can appear too small in the picture. There is also a lot of curvature at the sides of the image. This can make the horizon look unnaturally curved. We recommend that you use an sports cam with a narrower lens angle for a more linear appearance. For example the DJI Phantom 3 quadcopter uses a lens with 94º FOV (equivalent to 20mm in film photography). The Vision aerial camcorder with its lens FOV or around 120º is a good comprimise. With the WiFi functionality you can use the included wifi remote control to start and stop the recording from the ground, or preview and check the camcorder angle from a smartphone. It can also be mounted to other radio controlled models, such as helicopters, planes, gliders and boats. Quadcopters can also be used for outdoor sports photography. For sports like skiing and mountain biking a quadcopter can be set to follow the rider along whilst filming. This gives a unique sky high view of the action including the beautiful wide scenery. 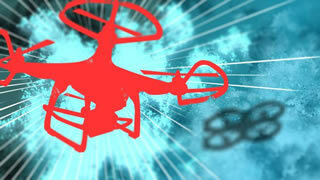 Specialist quads are used with tracking devices, such as the Air Dog quadcopter. They can also be used for filming watersports, such as surfing, kitesurfing and sailing, where the water would be difficult to access for conventional photos. Furthermore still photos can be taken with the quad set to hover in a fixed position using a GPS coordinate (loiter mode). This makes for some very interesting aerial photography that would be difficult to achieve otherwise.